It is said that John McLusky developed the face of bond that we know today. From the early smoother but slightly ruffled visage, to the more rugged look as the strip feature became established. This is the iconic face that we have all come to know, signed by John and appears in books and magazines worldwide. The Face Of Bond is now available as a limited edition print, with a card mount, sellophane wrapped. 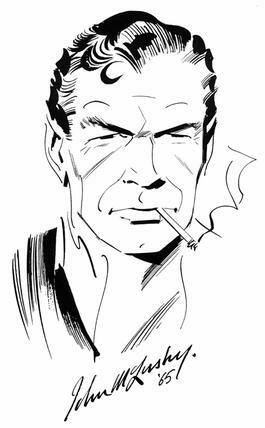 There are only 1000 prints of the face of bond in this series. MOUNT SIZE: 8”¾ x 11”¼ – Ready for you to put in a favourite frame.